TALK ABOUT A GREAT FIND! 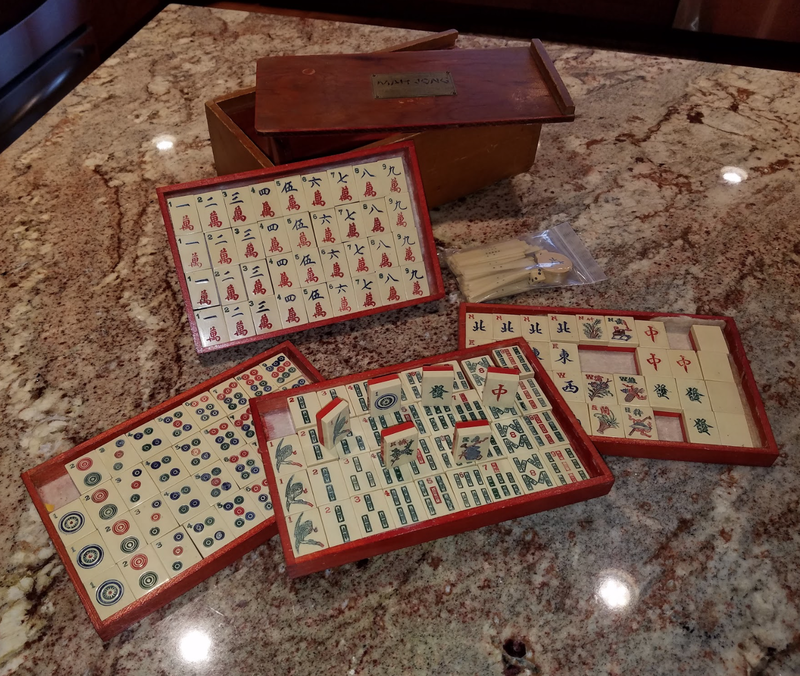 I wanted to pass along some photos of an unusual set I purchased recently. It came in a wooden box with a slip-in top. There is a brass name plate with “Harr Products, Inc.”, so I’m assuming it was produced by L.L. Harr. Mr. Harr also was responsible for Pung Chow sets, so why the different name, I’m not sure. 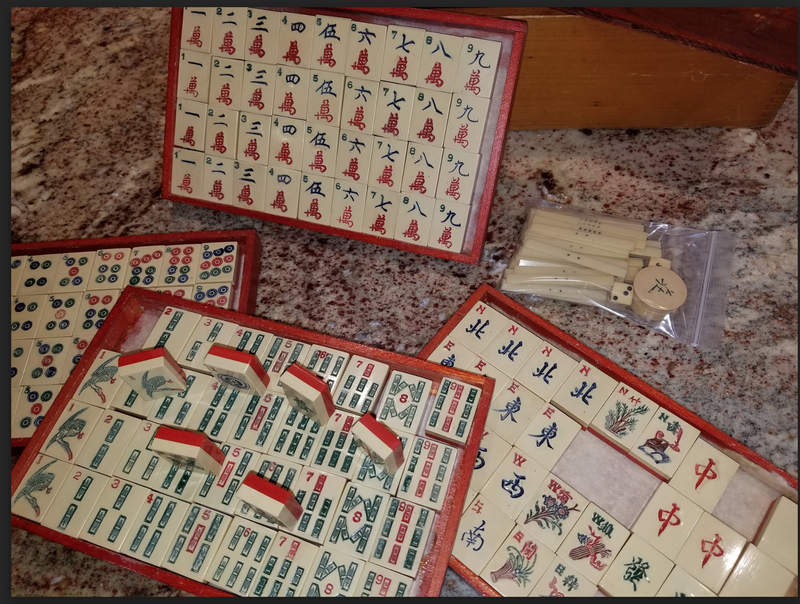 I have seen that Pung Chow went out of business in 1925, and Mr. Harr passed away in 1931, so I’m at a loss on when, where and why this manufacturer produced sets. It is a two tone (Ivory white fronts and cherry red backs) set that appears to be a Pyralin-like material. It has the flipping crane one bams that are common on Pung Chow sets, but the flowers are completely different. I noticed your request for unusual set photos when researching the similarity between Coronet and Pung Chow graphics. I’m sure you’re aware the flipping crane one bam and flowers are almost identical between the two, but I can’t seem to find out why. If you have any information on this similarity, I’d love to hear. If anyone knows the answer to Mark’s questions, please let us know! But for now, enjoy these photos! This entry was posted in Mah Jongg and Me and tagged Coronet, L.L.Haar, mah jongg, mahjong, Pung Chow, pyralin on July 7, 2017 by Mah Jongg and Me. I was wondering who got that set! Mark can contact me if he likes, I’ve done some research on the set, nothing conclusive, but collaboration generally produces good fruit. A beautiful set! How interesting. My strong suspicion is that the set came earlier, if it was indeed made by L.L. Harr. Would be curious to hear what others think and/or know! 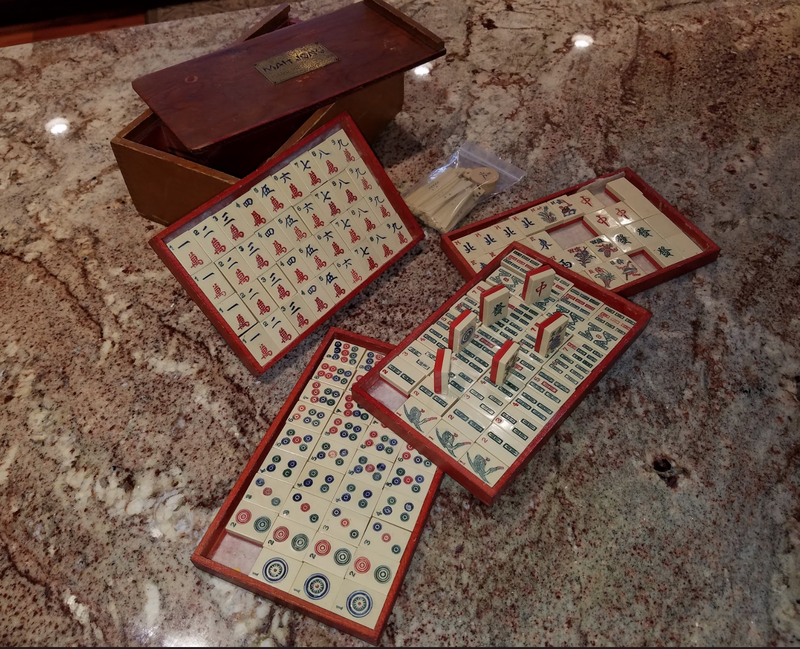 Thank you Johni and Annelise for adding your thoughts…I’m hoping we can build a better idea of the early history for this set, and in turn the game we love. I’ve only found a limited amount of information on this set, and much of it is indirect. I’ve looked into financial reporting to try and find out a history of the two companies L.L. Harr was involved in. Pung Chow is the company we’re all more familiar with and I can find stock transaction records in archived financial newspapers dating from the early 20’s. The first record I can find for “Harr Products, Inc.” (which is the name given on the brass name plate found on this set) is in November 1925. Shares of preferred and common stock for Harr Products, Inc. were being sold through a Boston brokerage at that time, so my suspicion is that this came after Pung Chow went bankrupt. Obviously this isn’t definitive, so I encourage anyone who can add to, or just wants to comment on, to chime in.